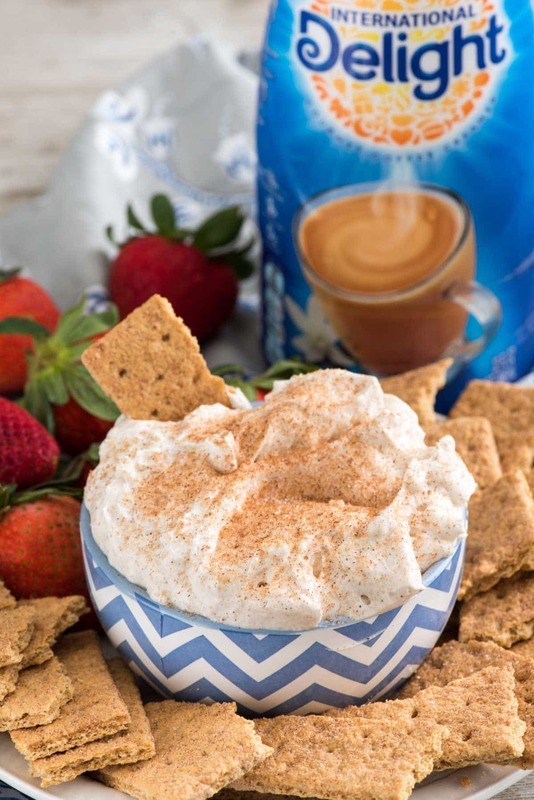 Churro Cheesecake Dip – an easy way to make no-bake cheesecake dip full of cinnamon sugar churro flavor! 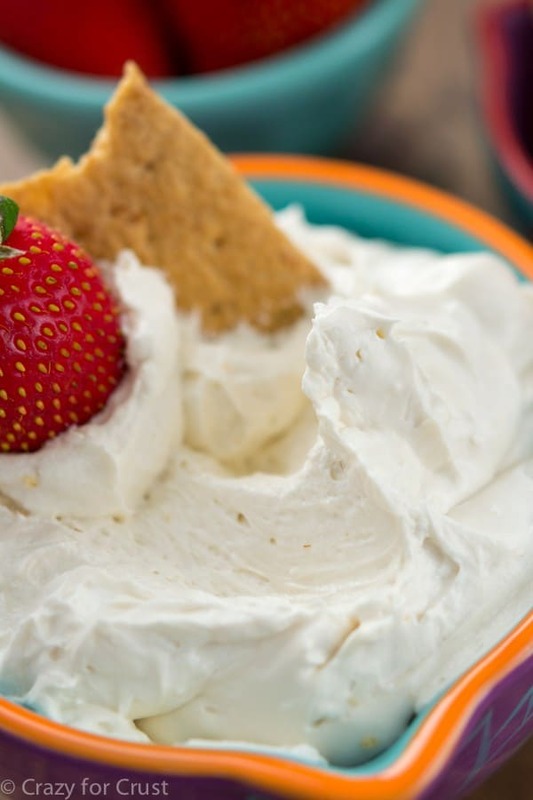 This is the perfect party dip or an easy dessert recipe. When I was in Charleston last week we ate a LOT of food. We went to restaurants for three meals a day: biscuits, doughnuts, BBQ, fried food EVERYTHING. There was rarely a meal where we each ordered our own thing; most of the time we just shared a bunch of different appetizers because we wanted to taste all the things. My favorite? Probably the biscuits. Or the doughnuts. Or the truffle tator tots…or the fried pimento cheese or … all of it. My favorite way to eat is to make a bunch of appetizers or dips and just go to town. Things like cheesy pesto or lentil dip or pepperoni pinwheels…I can make meals out of any of them (or all three at once). I rarely throw parties with a main course; my favorite way to host is to just have a ton of appetizers so people can pick all night…and that includes dessert! 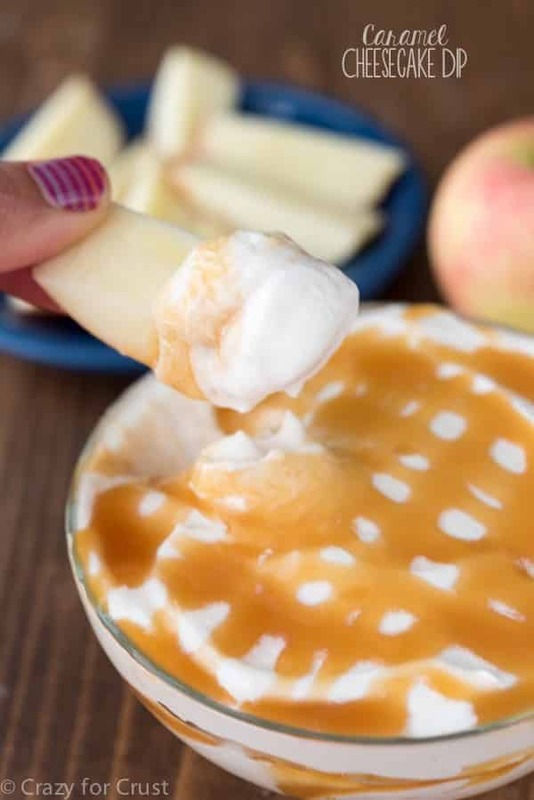 Dessert dips are some of my favorite sweet treats. I save calories by using a spoon, plus they’re delicious to have in the refrigerator. They’re easy to make and even easier to eat, which is why I have a 25+ of them on this blog. Hands down, my favorite dessert dip to make is cheesecake, which if you’ve followed me for any length of time, you’d already know. I have so many different varieties (skinny, peppermint, peanut butter, mocha, caramel…the sky is the limit). And now? 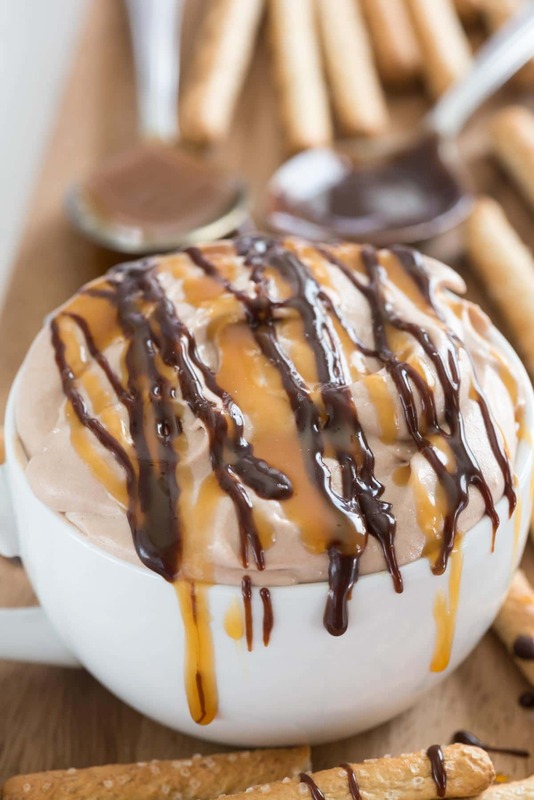 Now I’m adding CHURRO Cheesecake Dip to that list of amazing cheesecake dips! This easy peasy churro cheesecake dip is full of cinnamon flavor and then sprinkled with cinnamon sugar. I made it a different way than my normal cheesecake dips so it’s more fluffy than normal, which I think I prefer. This method uses heavy whipping cream to fluff it up and it’s the lightest and best cheesecake dip I’ve ever made. 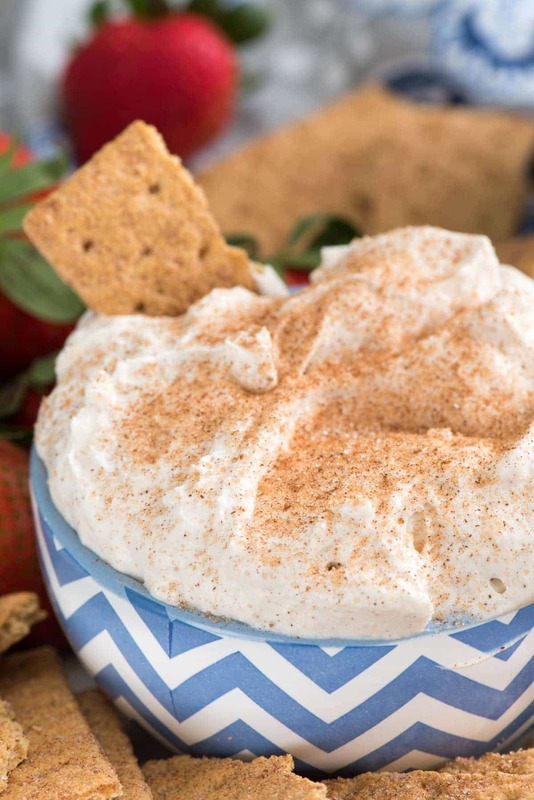 I eat this sweet cream cheese dip with a spoon, although I serve it with cinnamon graham crackers and fruit. This is also a wonderful fruit dip because it’s light and airy, and a lot like a cheesecake whipped cream. It’ll get the kids to eat their fruit, for sure! The secret to making this churro cheesecake dip light and fluffy is to add the heavy whipping cream as you’re mixing. Then you beat it until peaks form, like whipped cream. It’s airy like whipped cream but has a tell-tale cheesecake flavor. The sprinkling of cinnamon sugar makes this churro cheesecake dip recipe one for the record books. Churro Cheesecake Dip - an easy way to make no-bake cheesecake dip full of cinnamon sugar churro flavor! This is perfect for parties or an easy dessert; we loved it! Place cream cheese and 1/4 cup sugar in a large bowl. Mix with a hand mixer until smooth. Mix in the creamer and 1/2 teaspoon cinnamon, then add the heavy whipping cream. Turn the mixer up to high and beat until whipped cream forms. Transfer to serving dish. Stir remaining cinnamon and sugar in a small bowl and sprinkle over the top of the dip. Serve with fruit or cinnamon graham crackers. Connect with International Delight on Facebook, Instagram, and Twitter. I can picture all you girls ordering a ton of different menu options and sharing and trying allthethings. That is the best way to go, always! And this dip looks like a winner! Skylar had a churro after a cheer competition last weekend but it was dry and not worth the calories, I would have much rather had your dip! hey girl- this dip looks soooo good! This sounds delicious! Something my son would eat and like! LOL kids are funny that way! Um, I just want to face plant in this if that’s okay. Been craving churro things like crazy lately–can’t wait to try this one.